Crosier, Fairbairn, Fairburn, Grozier, Nixon. 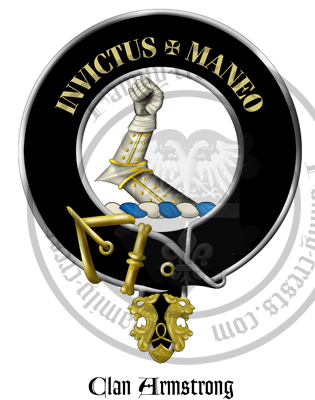 Clan Badge: An arm from the shoulder, armed proper. The Armstrong name has a mythological origin, in that it is said their heroic progenitor, Fairbairn, saved his king of Scotland in battle, and not from a wild beast as is the case with another Border clan - the Turnbulls. It is said that, dressed in full armour, he lifted the king onto his own horse with one arm after the King's horse had been killed under him in battle. The family crest records this act of heroism that was to be rewarded with a grant of lands in the Borders and the famous Armstrong name. To see sae mony brave men die." In 1587 an act was passed by the Scottish parliament "for the quieting and keeping in obedience of the inhabitants of the Borders, Highland and Isles ..." That contained a roll of Chieftains and clans that confirms the status of Border families as an important part of clan history, and the Armstrongs as perhaps the most significant Border clan. The clan's authority resided intact at Mangerton in Liddesdale, a succession of Armstrongs retaining the 'Laird of Mangerton' title, until 1610 when Archibald Armstrong was 'put to the horn' as a rebel. After this, the Armstrong lands passed into the hands of the Scotts. 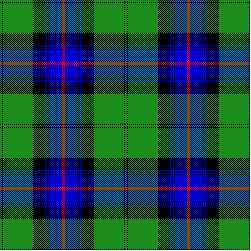 The clan is currently represented by the Clan Armstrong Trust in the Scottish border region. 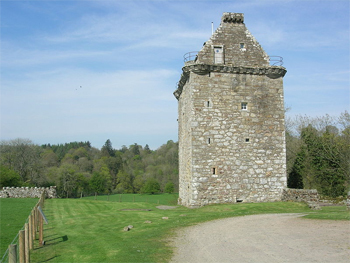 Gilnockie Tower is the home of the Clan Armstrong and houses the Clan Armstrong centre.